Check out our news articles to see what's being said about these must-see JBF events! These stories really brought out how Tulsa families are using JBF sales to make a difference in their budgets, closets and wallets! Lots of great stuff in this footage! As the nation's leading children's and maternity consignment sales event, Just Between Friends enjoys increasing media coverage as word gets out about these great savings and deals extravaganzas! As one of the more than 150 events nationwide, the Tulsa Just Between Friends sale is the first and largest sale in the nation! And that's worth talking about! VENDORS & SPONSORS NEEDED~If you have a small business that you would like to promote, contact us today! How would you like to reach thousands of area moms with your family-friendly business? JBF has the customers for your business! 1.Familiarize yourself with the vendor prices, policies and procedures by printing our Vendor Application. 2. Please sign up to add your business to our mailing list. When you register on our site, please tell us your business name and products/services provided in the comments section. 3. Vendors will be taken on a first come, first served basis. Please make sure that you contact us early to get a booth space! We sell out quickly!! No duplicated exact vendors. Please email paul@jbfsale.com to see if space is available for your business, now! 4. If approved and space is available, please Register as a Vendor by sending in your payment and application to the address on your application. The first paid vendors will be the vendors we take for our event. Just Between Friends is honored to have a special partnership with Emergency Infant Services (EIS) of Tulsa. We will be taking donations of diapers, formula, baby food, and "new" layette items as well as cash donations for EIS. With a donation, shoppers get in the JBF Tulsa sale for FREE. With thousands of families in need, this money has changed lives! Way to go Tulsa JBF! 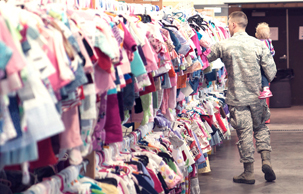 Since 2000, JBF consignors have donated thousands of items to EIS and have helped countless families in doing so. It is great to see how generous our consignors are! We were also able to donate your larger children's items to Catholic Charities...Way to go consignors!! Many of our consignors also donate to Catholic Charites! Their vision-As a conduit of Christ’s love in providing works of charity for all people – those who receive and those who need to give – we will continually assess the needs of the whole person — material as well as spiritual, gather the necessary resources and assure the provision of programs accessible to those served.